Earlier this year, ABC released the story and photos of ESPN anchor Hannah Storm, who was burned badly while using a propane gas grill in her own backyard. She suffered first- and second-degree burns attempting to light her grill in the same way that many of us do. Her story serves as an excellent warning as to the dangers of propane tank explosions. Hannah had lit her outdoor propane grill on a cold evening, and went back outside to check on the temperature of the grill. She found that the wind had blown out the pilot light, and the grill was cool. She turned off the propane gas, and then turned it back on. Because the cover of the grill was opened, she assumed that it was ok to re-light the grill without any risk of fire. Unbeknownst to her, the propane vapors were heavier than air, and had been gathering and pooling at the bottom of the grill (despite the grill not being on). When she re-introduced a flame, an explosion occurred, setting her on fire. Fortunately, Hannah escaped without catastrophic burn injuries. She is very lucky. 76% of Americans own and enjoy propane gas grills, using them for cooking outdoors with family and friends. It only takes a split second, though, for this to turn into a disaster, as it did for Hannah. 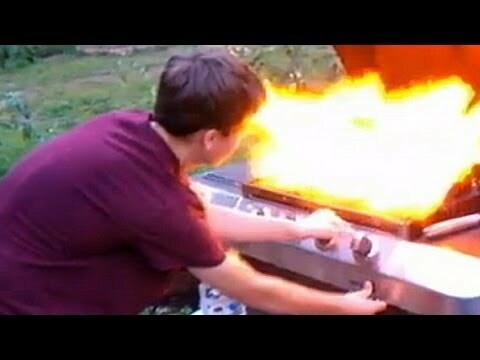 Approximately 20 deaths each year are caused by propane fires and explosions associated with gas grills. When propane tanks are exposed to excessive heat, the gas itself expands. If there’s not enough room for this inside the tank, a pressure release valve will open in order to allow propane gas to be let out of the tank. This process is venting…It occurs when the internal tank pressure exceeds 375 PSI and it prevents the tank from an explosion. When the venting actually occurs, you will smell a pungent odor similar to “rotten eggs”. Propane is an odorless gas, and otherwise you would not realized when a gas leak might be happening. The awful smell is actually from the ethyl mercaptan, and additive mixed with propane to alert our sense to a leak. When gas is released from the tank during venting, and there is no odor, “odor fade” taking place. If the propane leak is undetectable, it places you in grave danger. There are also many instances of propane leaks causing explosions while propane tanks are being transported. Make sure the tank has plenty of ventilation while in your vehicle. How Long Before the Mercaptan Odor Fades? Experts claim that the odor of ethyl mercaptan disappears over time, anywhere between 5 to 7 days after a tank has been filled. It can become completely undetectable as soon as 3 weeks after the tank is filled. Learn from Hannah that propane is heavier than air. Just because the grill lid has been opened doesn’t mean the propane has dissipated. Also, learn to recognize the smell and listen for a possible leak problem with the tank valves. Check propane tanks for tips on staying safe! It is our hope that you will use this information along with Hannah Storm’s story to protect yourself from a propane explosion. Also, check out the NFPA’s grilling safety tips. Many times, propane tank explosions are caused by the negligent or reckless conduct of another. Contact the Burn Injury Firm at 866-293-2615 for a free consultation regarding any such incidents.